Life in Dakota territory was tough. The only people who wanted to live there were the fur trappers and the Indians. For ten years there had been peace – no Indians had been shot and no white men had been scalped. Then somebody decided they didn’t like it that way. Strange ‘accidents’ began to happen to the Indians – like the body of Three Crew (or what the wolves had left of it) being found several miles from his burnt out hut. This book finds Kane taken out of his usual stamping grounds of deserts and heat and sent to a state gripped in winter, having to face the risk of freezing to death. Kane discovers that near the frozen solid bodies of each dead Indian are tracks of a sledge and two men, and then, after the horror of a massacred Indian camp, the hunt is on. Somehow I didn’t feel that Masterson (Kjell Hallbing) was as confident writing this book of a land of cold and snow as he was writing about heat and desert landscapes. Kane was his usual self, tough, brutal and relentless in his pursuit of the killers and in finding out the reasons for these strange deaths. Masterson also didn’t put Kane through any of the cruel heartache that he usually does either. The story almost having a happy ending for Kane this time around. I found Hell Below Zero entertaining enough but would place it with the weaker entries in the series. Maybe it’s the translation that failed to convey the true atmosphere of this book. I remember seeing these books in the shops when I was a western reading kid - alongside the suddens, the edges and l'amours. Strange I've never read him and don't seem to have any in my considerably large collection. I'll have to hunt some down. Along with Steve, I highly recommend the Morgan Kane books. In spite of some very poor translations. I wish I could read them in the original Norwegian, because I have a feeling they're much snappier in their mother tongue, and probably grittier, too. 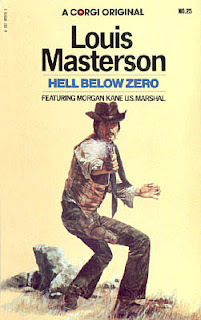 HELL BELOW ZERO was my first Kane, after my friend Jan Pettersen, sent me a bunch from Norway. Hallbing has the landscape all wrong--I grew up in the Turtle Mountains of North Dakota (Dakota Territory during the period Hallbing writes about), and they're really no more than wooded hills, and I've skiied or ridden snowmobiles over every knoll and knob--but it's still a helluva read! Thanks for reviewing it, Steve. I wish all of the Morgan Kane books would be re-translated into English. Like you Peter, I wish the rest of the Morgan Kane books were translated and published in English. I have the 41 that were. Gary, they're definately worth checking out, they appear on ebay (UK) quite often. all morgan kane books is comming out as ebooks. Odinguden, I don't stop seeking them as ebooks without the least trace on the web. However Morgan Kane is based on James Bond from Ian Fleming,at another time. One of these days, perhaps. With those still to translate in french or in english….